An integral part of your cropping operation is your combine. A combine is a big investment and needs to be taken care of in order for it to work efficiently and to stand the test of time. Not everyone can afford to purchase a new harvesting machine. For this reason, it is crucial to take good care of your older equipment so that you can avoid the extra costs of purchasing a new machine or using a contractor to harvest your crop. Good maintenance is also essential as new parts are expensive and sometimes hard to come by for the older machines. One needs to make sure you do all that you can to mitigate damages. When using older tractor drawn combines there are a few important processes and routines that one needs to follow to keep them working and on the go. The following needs to be checked on a regular basis, especially before the harvest season begins and routinely throughout the harvest time. Older combines have lots of moving parts, from the intake to the outlet. Every drive shaft that rotates and turns is driven by a chain which runs on a sprocket. It is crucial to make sure that chains are well lubricated and set to the correct tension. If a chain is loose it will slip, which will wear away the teeth on the sprocket. You will also have lower efficiency of grain intake thus lowering your yield. Chains are not extremely expensive so it is wise to replace any chain that is not in good order. Make sure that the sprockets that the chains run on are also in a good state as these are also directly linked to the efficiency of your machine and keep everything running smoothly. Sometimes new sprocket spares can be hard to find for the older combines. If this is the case you will need to get an engineering works to build you a new one. Belts and pulleys also run shafts and need to be turning smoothly without strain and resistance. It is very important that they run well so that you avoid secondary damages to shafts and chains. Belts can get weathered over time, becoming brittle. They can also stretch causing them to slip. Make sure that belts are set nice and tight and that they are in a good condition. Belts come in all shapes and sizes so when purchasing a new one, make sure that you take the old one with you as a guide for size. Bearings experience a lot of wear and tear especially in dusty conditions. These need to be checked pre-season and daily during harvest time. They need to be well greased and lubricated on a regular basis. If a bearing goes it can also cause secondary damage if it is not noticed quickly. The following parts need to be checked occasionally especially pre-harvest time. Cutter blades cut the stalks before they are taken into the machine. They need to be sharp to avoid clogging and dragging of un-cut plants under the combine. Older combines such as the Slattery single row have three sickle blades that rotate at the base of the intake. They are easy to change and spare blades are readily available at most farm equipment dealers. Make sure that the sieves don’t have any holes in them and that they are not rusted and perishing. A poor sieve will negatively impact the quality of your grain’s grade as stalks and dirt clods will not be removed effectively. Augers should be in a good condition as they move grain into the hopper and also from the hopper into the trailer or truck. Check that they are not worn on the perimeters as this will leave grain behind and can also split your grain by ‘milling’ it between the auger and the casing. Check that there are no holes in the auger blades which will reduce the efficiency of your machine. Make sure that the hopper does not have any holes in it. Sometimes the metal lining of the hopper can rust away causing holes for grain to leak out. This kind of waste needs to be avoided at all cost. If there is a hole, be sure to patch it by welding a new sheet of metal over it. Set the beaters before harvesting commences. Beaters can be set to be more or less aggressive. 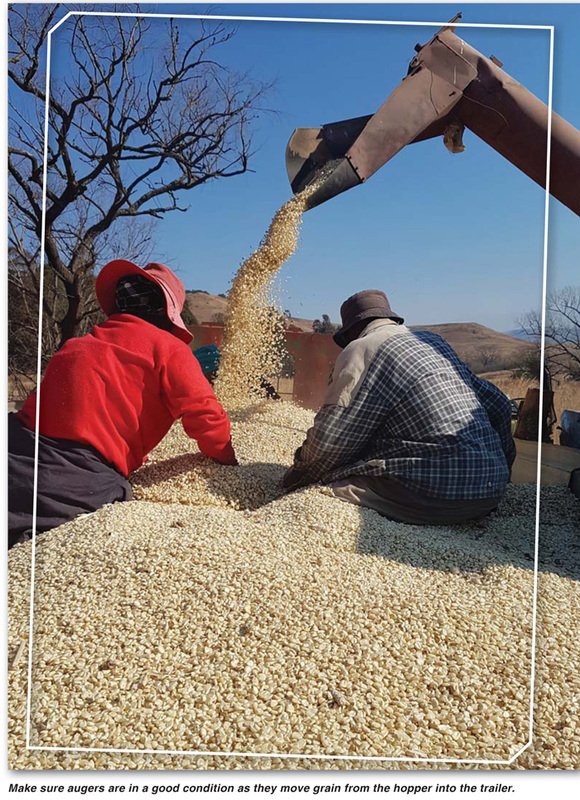 When you start harvesting, do a small trial and check the quality of the grain. If there is a lot of breakages and splits you will need to set the beaters to be less aggressive. 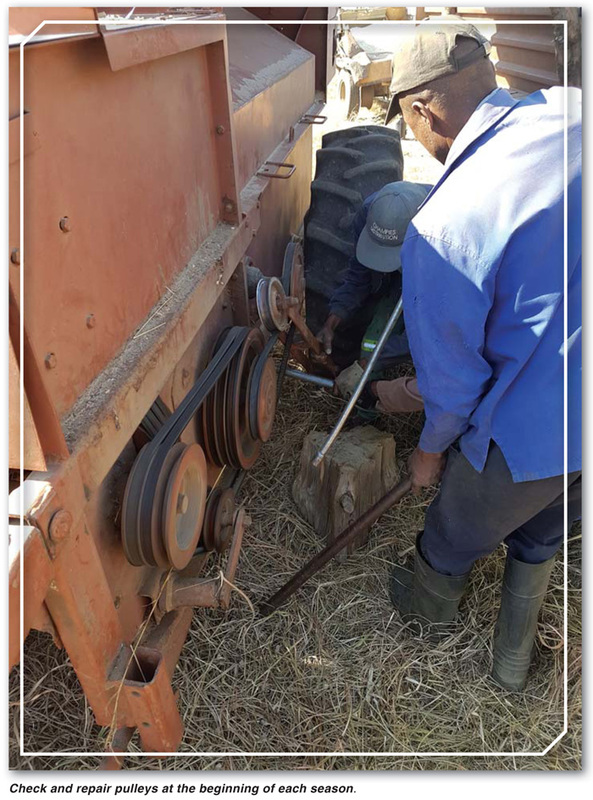 This is a simple process of loosening the bolts which fasten the beaters onto the main intake auger and moving them out or in. Older combines can still get the job done. They were built well, but they also need to be looked after well. Make a routine of following the above steps to keep them moving and grooving for years to come.